Start by creaming together the butter and sugar. Add the crushed bananas and mix well. Then add the eggs and mix. Once it's blended, add the flour, baking soda, and vanilla and mix until just combined. 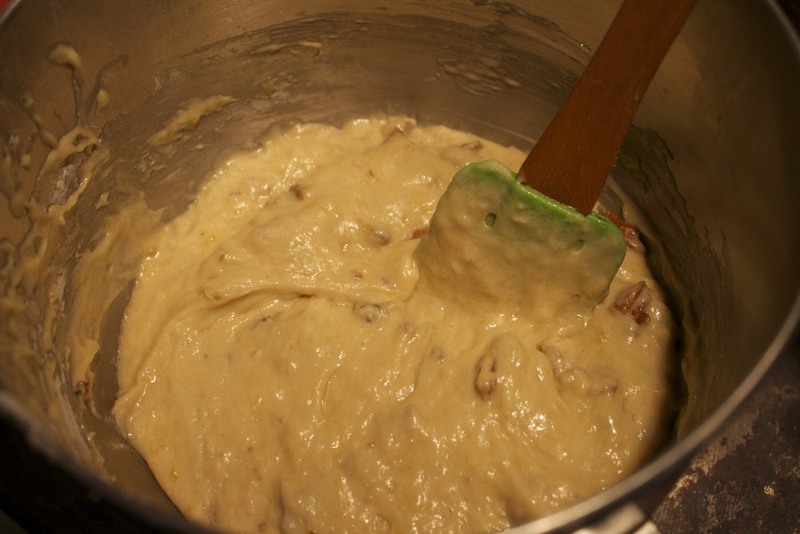 Stir in about 3/4 of the chopped nut then pour into a loaf pan. Sprinkle the remaining nuts over the top and bake at 350 for 45-60 minutes. Check the bread after about 45 minutes to see if it's done enough for you. To me, the best part of banana nut bread is the gooey center that sinks down after you take it out of the oven when it's slightly under-done. That's the part we always used to fight over. If you aren't a fan of that gooey goodness, just keep in the oven a little longer. This is great warm out of the oven or cold or toasted with a little butter. Any way you cut it, it's delicious. June 14, 2013 by Lynn Adams.